Wayne and Cindy Langford have always enjoyed a good cup of coffee, and identified a gap in the market at events. There are always plenty of vendors selling beer or cold drinks, with some even selling mediocre coffee – but good coffee is hard to find. 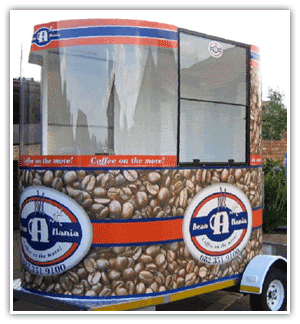 This led to the development of Bean-A-Mania, a company that specialises in providing espresso based coffee at corporate and leisure events. The idea was to not have a traditional vending trailer, so research was done regarding different trailer options, and a fibreglass option was selected. The trailer was designed by Martin Coetzer of Smart Worx and built by Zamori Fibres in Jet Park. The actual machine used to make the coffee is also of great importance in getting the right mix, and research was conducted into which machines offered the best mix of quality, speed and reliability. 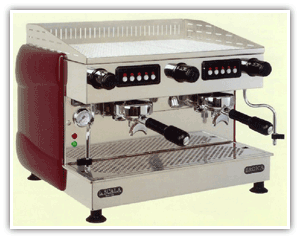 It was identified that the la Scala range of machines offers superior performance and reliability. The pre-infusion head is also considered to be one of the best in the industry. The local agents for la Scala also provide a reliable service and supply a loan machine if repairs cannot be affected on site.